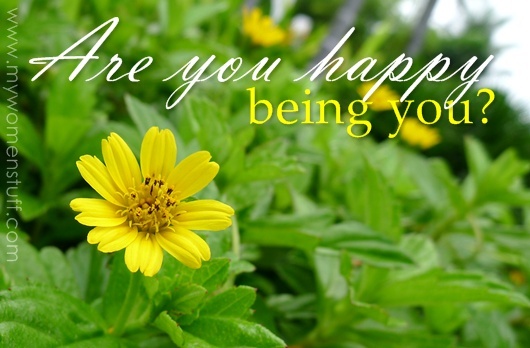 Home » Interesting Discussions » Your Say: Are you happy being you? Your Say: Are you happy being you? Goodness! The list goes on, doesn’t it?! I’m human and thus not infallible. I confess to always wanting more – to be thinner, taller, richer, prettier … you name it, I’ve wished it at some point. But it was only when I paused for a moment, took a step back, and took a good critical look at my life, that I realized that whilst it was fine to wish to be all those things, I really should just be happy with being just me, and enjoying my life right now, instead of craning my neck over the horizon to see what might be better. I have all my 5 senses intact, I have all 10 fingers and toes, I have a roof over my head and food in my belly and am relatively hale and hearty. I really am not doing too badly, everything considered 🙂 Being ambitious is one thing, being unhappy with being who you are, and not doing much about it, is another. Well … I’m generally quite insouciant – I couldn’t care less about competing with the rest of the women who are perpetually vying to be beautiful, but when it comes to relationships sometimes I feel quite inadequate because I’m not the best person I can be for my significant other. I feel I am too thin! Every time I meet my family and relative on holidays I dread the question “are you eating well?” It is frustrating trying to explain to them that no matter how much I eat (and if possible, hibernating for the whole year); I just couldn’t gain the weight. Ooh! I hate being called skinny! Interestingly, I’ve met a few people in your situation. Just count yourself lucky you can have all the chocolate you want, while the rest of the female population content themselves with the smell 😉 So long as you’re happy and healthy, I think its all good! Quite so. Most of the time the aspects we want to improve, we don’t realize, are either superficial or materialistic. Hehe. We can never have too many wants, can we? Despite all those wants, we have to know valuable things are immeasurable 🙂 Things that make us, US. Well I would definitely like to lose some weight and have a bit more money to spend, but all things considering, I AM happy. Because I am thankful for my loving (albeit the teeniest bit dysfunctional) family, amazing friends, my health and having a job I truly enjoy. Sometimes life passes us by so quickly we forget to stop, take a breather and count our blessings. Thanks for posting this – I’m sure it made more than a few of us stop for a few moments and think about ourselves and our lives (something many of us sorely need, for sure!). I’m happy with the way I look because like you, we’ll never achieve that level of perfection we aspire for in terms of looks. Even supermodels have their insecurities. All I do is make do with what I have and enhance them. What I’d like is to be myself and not try to form or change myself into someone that someone else wants me to be. Be true to myself and accept that I have flaws, I have my strengths and it’s the whole package that makes me ME. With everything that’s happened in the past few months, it’s been pretty hard to look at the bright side of things…but hey, they’re slowly getting better. And once we hit April, I should be on track to get back to my old self! Except for the lack of sleep, LDR and low pay… I wouldn’t exchange my life and looks for anyone else’s. Well, maybe Vanessa Paradis’. Or whoever is dating Edward Norton. I guess it’s just a matter of perspective. No one has everything. But end of the day, all things considered, I’m happy being me – flaws and all – because I’ve got all the things (and people) that really matter to me. I think we are very lucky, look at Japan Tsunami, people are homeless now, lost loved ones, exposure to radiation. Things that money can’t buy back. I agreed with you, in the sense we are in perfect health, no other major shortcomings, we should be happy. But sometimes, we just wish for a little bit more, slimmer, taller etc. As for me, I should be happy, just that I am in the midst of change to look out for a better career/business…….which I have no idea what to do yet….. Funny that this came up in your post today when I was just thinking about it last night! Despite having gone through a lot of ups and downs in life, I do feel that I am happy with who I am because without the good and bad experiences, I wouldn’t be who I am today. Sure I do wish for little things (like if only I could go back to being as slim as I used to be or being more sociable) but if it’s something that I can do about it (say shedding off a few kilos and building the confidence to be more sociable), I’ll do it! Given a choice i would want to be prettier, skinnier, richer, less sweaty and have the ability to eat a cow and not gain a single miligram (who doesn’t?)! But I have husband who spoils me rotten, a supportive family, a traitor dog who loves my brother more than my husband or myself, a roof over our heads, food in our stomachs and a little cash leftover to visit nearby places together – that i will not trade for anything in the world! I used to worry about my looks and body but now that I’ve bagged myself a handsome husband and gave birth to a gorgeous baby girl, all that doesn’t bother me anymore. Sure I’ve put on weight now but I would say I’m MUCH happier with life and where it has taken me. I would love to be a better writer, musician and student. I would also love to be able to think out of the box like my other University mates in the Arts school. But most importantly I would love for my eczema to go away. I have a patch between my nosr and lips that’s constantly cracking qnd spots all over my legs. All in all, I am rather happy with who or what I am, and I do realize that other than my eczema, all my flaws are my own doing. I guess that I’ll have to find a way to improve myself then. I can say that I’m quite satisfied with my life. Yes, I admit I do complaining about myself in quite lot of time, easily get fat, bad skin, frizzy hair, SHORT (i just 148cm.. geez! ), but I realize how beautiful my life is. I can study abroad, I have a wonderful boyfriend, I have money to spend, I have everything I need that should be a luxury as not everyone in the world have money to spend even for food they have hard time. I dont have happy family, but I guess Im lucky enough to know my parents. Actually it is about how you see life. but i hope i can do more exercise , eat healthy and stay in good then!